Representatives from the military, business and colleges and universities were on hand to speak to students about their offerings. 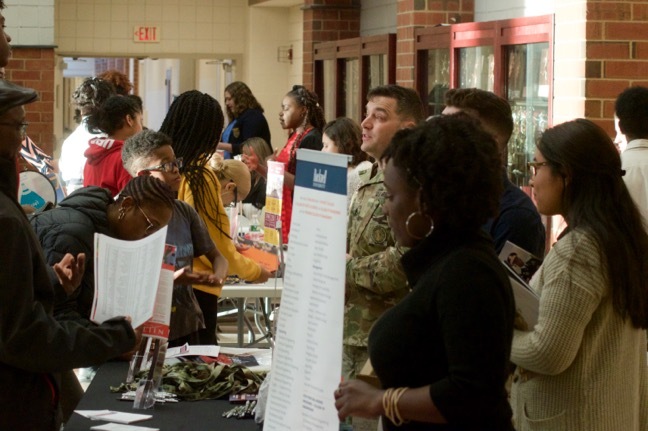 Nearly 100 representatives from colleges, businesses and military branches were expected at the annual College Fair and Career Night held April 4 at Franklin High School. Jackie Schumacher, an FHS guidance counselor, said that attendance by those wishing to woo students has been increasing over the past few years. “We have representatives from colleges, universities, technical schools, military programs and career options here to present what they have to offer to our students, so that we have information out for our students about opportunities after high school,” she said.